This is probably one of the first Aussie EP I ever heard, if not the first. My sister brought it back on a cassette compilation (remember them?) after a visit home. At the time in Europe we weren't listening to this, but we got primed and ready when they finally moved to Londn and started touring. For me, it was a shock, as their music typified the vision I had of Oz, or Western Australia at least… a parched, dry land, laid wide open for you. At the same, it is a terribly forlorn place. 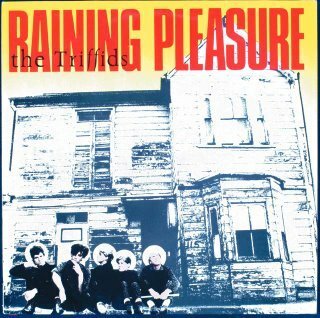 The song "Raining Pleasure" is probably the perfect aural postcard of Perth at that time. This is also to follow RYP post of Treeless Plain. If I remember well, that Ep cost me something like AU$ 5.95 at that time, I'm pretty sure i bought at Rythm & Records in Perth… in 1985. Property is not yet condemned. 256k, with both covers. I gotta say, that I remember so well how hard the guys tried to get Jill to sing this one. She was so shy & had no vocal training whatsoever. Live she used to turn her back to the audience basically b/c she was just terrified. this one is a fine pleasure to me. I love the decade of Treeless Plain most. have I started listening to the triffids I can't stop and when i stop there is nothing else i want listen to.